Talk about the 80s and one of the inevitable facets of pop culture that surfaces is the integration of computers into our personal lives. Tron, a 1982 movie that was one of the first to use extensive CG effects, spear-headed that mindset for the children of the era, postulating a world where programs were people that literally fought for their lives in the games we played in arcades. 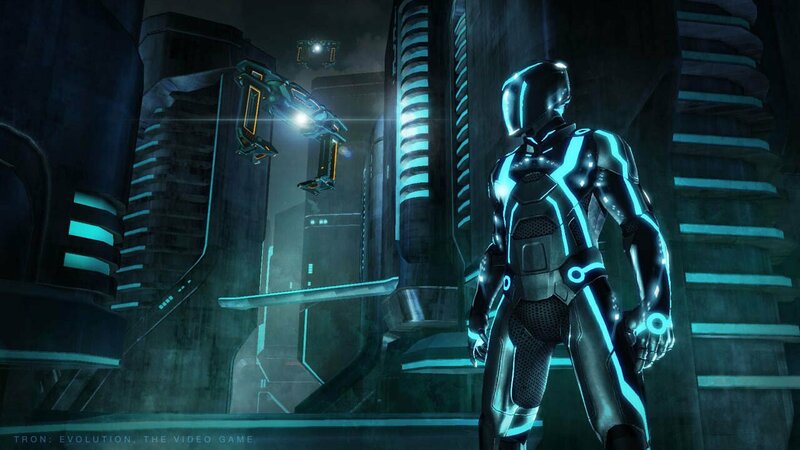 Now, with the newly released sequel in theaters, a game is available that bridges events between the original film and Tron: Legacy, and mostly it works. Tron: Evolution is that rare movie property that doesn’t base itself directly on the events of the film. Instead, it reveals events after the original Tron that create the situation Sam Flynn, hero of Tron: Legacy has to sort out. Here, Kevin Flynn is a benevolent god of sorts, known as The Creator of the system, which is a closed network he lords over. His joy over the discovery of Isomorphic Algorithms, artificial intelligences that have spontaneously appeared in his system, creates a schism between himself and Clu 2, the AI he created specifically to oversee his network. A coup d’etat occurs and it is up to you, a Systems Monitor program known as Anon, to rescue The Creator and restore order to the system. Visually speaking, there’s little to complain about in Evolution. After all, the conceit of the story is that it all takes place in a computer world, and is thus not subject to expectations of photorealism. Instead, the final arbiter is the art direction, with the neon lines of the source material ever present, only now in high definition. The game is true to the visuals of the new film, and, thanks to the simplicity of the cinematic visuals, actually manages to account itself well. The only downside is in the presentation of its stars, with Jeff Bridges, Bruce Boxleitner and Olivia Wilde all turning in appearances that fall squarely into the uncanny valley. The environments however, show imagination and beauty, and there are no technical problems to speak of with a rock steady frame rate, and no issues with pop up, draw-in, or low level textures snapping into higher levels of detail a second too late. The sound on the other hand, is generally perfect, with iconic effects such as Recognizers and light cycles accurately represented, as well as the digital staccato of footsteps as Programs walk and run around the environment. Daft Punk, the DJ duo that also participated in film soundtrack, has lent their music to the game as well. While the overall sound quality is not full of realistic explosions, it’s consistent with the digital world the game presents. The quick n’ dirty shorthand for Tron: Evolution is it’s essentially Prince of Persia with some vehicle segments, clocking in at about 6-8 hours for the single-player campaign. Like Prince of Persia, Anon traverses environments that incorporate wall running, cliff jumping, and searching for handholds to advance through the levels, regularly broken up by arena-style combat that uses the signature “deadly discs” and the occasional light cycle or tank sequence for some vehicular mayhem. The controls are generally responsive, if a little twitchy at times, the largest offender being the light cycle, where oversteering is a regular occurrence thanks to the sensitivity of the controls. There’s also a novel—though largely gimmicky—option to use the Playstation Move controller held horizontally like a “light cycle control bar” a la the original movies. Combat is a simple, but unique affair, limiting the use of special moves thanks to a meter that drains with each use, and forces players to play a mobile game of combat, attacking and then retreating to regain health or special attack energy by running across strategically placed power strips in every combat arena. The only irritant in combat is the auto-targeting of enemies that tends to get confused in hectic fights. Like Konami’s Castlevania: Lords of Shadow, this is not about standing in place and spamming a move over and over again, it forces players to be quick or be dead. The vehicle segments are brief with players finally being able to play their own game of “Space Paranoids” from Flynn’s arcade as they finally take the controls of a tank and shoot Recognizers out of the sky. There’s also a levelling system in place that, surprisingly carries over between single player and multi-player games. Whatever XP and perks you buy for yourself in the campaign are useable in the multi-player, where the full host of Anon’s abilities finally get a workout. In multi-player, that XP gained in both modes goes towards boosting various stats such as health, the special attack meter, level of damage from special attacks and even perks like health regeneration that must be “equipped” before going into a multi-player round. Multi-player itself consists of the usual suspects such as death match (dubbed Disintegration) and team variants, along with capture the flag games (called Bit Runner) that involve taking possession of the infamous Bit while tearing about the play area in light cycles and, yes, getting people to run into the light wall trailing behind you, or, if certain nodes are captured, shooting at people in tanks. Tron: Evolution is best described as a safe game. There is nothing fundamentally flawed with it, it runs smoothly, with no technical problems, it has a variety of activities, from platforming to combat to vehicle activity, and it even tells an interesting story that sets things up nicely for the movie. If anything could be criticized it’s simply the lack of ambition. Levels never introduce anything new or noteworthy to platformers, and the combat works well, although targeting needs work, and the multi-player has enough longevity to keep those tired of first person shooters interested. But there’s nothing here with the same level of polish as the hardly original God of War or the sheer level design genius of the first Prince of Persia: Sands of Time. On the other hand, as a game based on a flim property it’s actually one of the better titles available, not dragging its namesake into the mud as the recent Iron Man or Superman games have done. As a straight on game, it’s good, but as a movie-based game, it’s great. There may be better, higher profile titles out there, but this is actually a solid title. 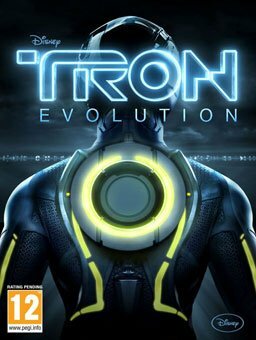 There is nothing fundamentally flawed with Tron: Evolution, it runs smoothly, with no technical problems, it has a variety of activities, from platforming to combat to vehicle activity, and it even tells an interesting story that sets things up nicely for the movie.